I’ve had a pretty bad record of procrastination when it comes to Daring Bakers challenges. The rapid decline of strawberry season last July meant that I really had to rush in order to make my Strawberry Mirror Cake, but since then, I’ve taken a much more leisurely approach to the deadline. With our own little sticky bun due to finish baking at any moment, however, I knew it would probably be a bad idea to put off baking the March challenge: Dorie’s Perfect Party Cake in Baking: From My Home to Yours , a white layer cake with lemon buttercream, coconut and raspberry preserves. It looked so fresh and cheerful in the photos that I thought it would be a perfect fit for our baby shower on March 7th, and the timing couldn’t have been better. Plus, I’m not big on lemon, so I figured that it was the perfect occasion to get a bunch of folks to help us eat it up. A few days before the shower, we went to Costco, and while Jeremy was poring over the muffin options, I meandered over toward the fruit aisle and delightedly discovered bags of Cara Cara oranges on display. I’d never even heard of them before this year, but I took the rave reviews on faith and lugged a huge bag of oranges into our shopping cart. That night I tried one out and found them absolutely delicious, if a little hard to peel and section (or maybe I’m just too used to satsumas now). In case you aren’t familiar with them, Cara Caras are a pink-fleshed orange known for being especially sweet and only mildly acidic, with a flavor reminiscent of a cross between oranges and ruby red grapefruit. 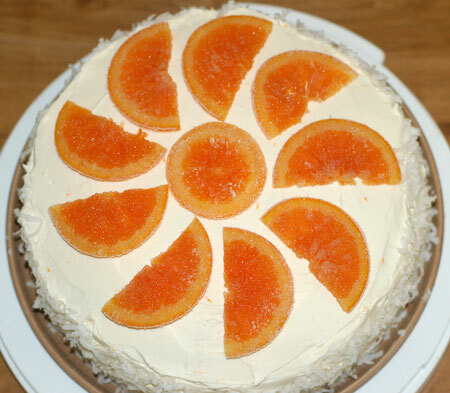 As soon as I took a bite, I knew that I wanted to flavor and garnish my challenge cake with these oranges, so after some consideration, I ended up making a Cara Cara creamsicle cake with cherry preserves and candied orange slices. The cake itself was incredibly easy to make. My only adjustment was using vanilla paste rather than lemon zest rubbed into the sugar. They came out pale and tender and gently domed, the latter counteracted by cooling them on the rack upside down. 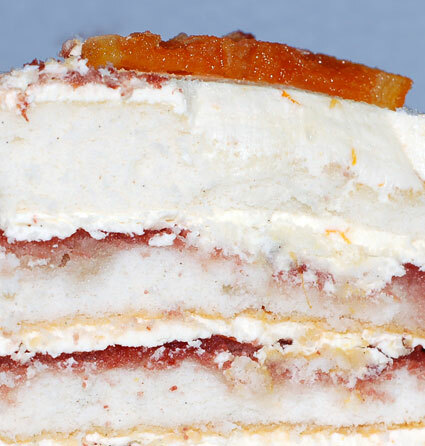 I’ve never done a real layer cake before (unless you count Jeremy’s German chocolate skyscraper cheesecake from last month), so my biggest concern was cutting the layers in half without mangling them or coming out all crooked. Somehow it all worked out beautifully, though. The buttercream was the next hurdle to tackle, but I had more confidence in this arena after making two flavors of Swiss meringue buttercream for my Yule log in December (which, incidentally, feels like just a few weeks ago… where has the time gone??). I followed the directions and didn’t hover in the kitchen while my stand mixer did its thing, and lo and behold: perfect satiny smooth buttercream with nary a curdle in sight. My buttercream was flavored with fresh Cara Cara orange juice and zest, plus the vanilla extract called for, and it ended up delicately colored and scented with orange. The third element, which I actually started working on first, was the candied orange slices. At first I intended to just candy the peels, but that pink-tinted fruit was so lovely that it seemed a waste to scrape it all out. Also, the process for candying whole slices was a little less onerous in terms of blanching, so I was able to spend a little less time on my feet, always an important consideration when you’re 38 weeks pregnant and counting. My orange slices simmered away in sugar syrup while I made and baked and cooled the cake layers, then continued soaking while I whipped up the buttercream. Before assembling the cake, I laid the slices out on a rack to drain, and strained the orange-infused syrup that remained. I couldn’t bear to let the latter go to waste, so I brushed each cake layer with some syrup before spreading on the cherry preserves (pureed to a smooth, spreadable consistency with my hand blender) and buttercream. I had to assemble my cake on an ordinary dinner plate, due to limited storage and presentation options. That was actually the most challenging part of the whole challenge, because the cake was nearly the same size as the plate. The waxed paper I used to keep the mess down was very effective at that job, but got in my way while trying to frost the bottom portion of the cake. Fortunately for me, coconut disguises a host of frosting ills, and looks pretty to boot! 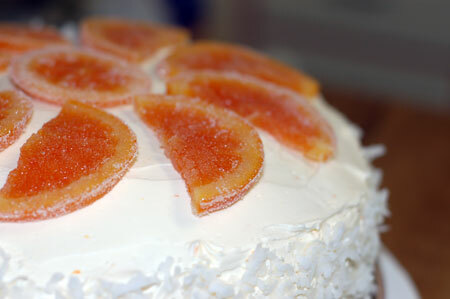 The frosted, but ungarnished, cake went in the refrigerator overnight, and the candied oranges were left out to air-dry. I turned them a few times to make sure they weren’t gluing themselves to the rack, and at lunchtime on party day, I coated them with granulated sugar and fanned them out on top of the cake. As Dorie recommended, I gave the cake a few hours to come up to room temperature before the shower. 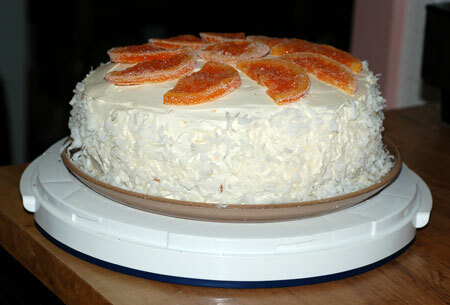 Many thanks to Morven for choosing a great March recipe; you can find the original version on her blog. I’ve had the cookbook for several months, and would likely never have chosen this recipe to bake for myself. Even though I fooled around with the flavorings, it was a rousing success, so I tip my hat to the Daring Bakers for pushing me, once again, out of my comfort zone. That’s why I’m a member, after all! Be sure to check out the hundreds of other Perfect Party Cakes (as if you could miss them!) 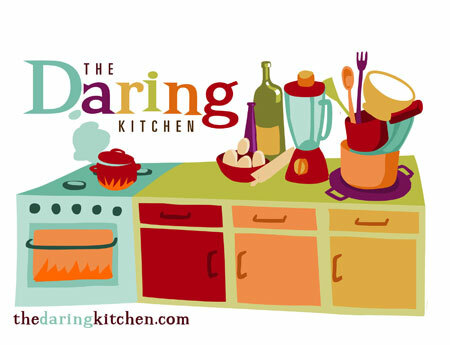 on the Daring Bakers Blogroll, to see how everyone else fared. Using a sharp knife, cut the orange into 1/4-inch thick slices, removing any pips. Meanwhile, bring the water and sugar to a boil in a large saucepan. Add the orange slices to the pot, cover and reduce the heat so that the syrup simmers gently. Cook, turning the slices every so often, until they are completely soft, translucent, and candied; start checking for doneness after about half an hour. Remove the slices from the syrup and drain on a rack; strain and reserve the syrup. Allow candied slices to dry overnight, then toss in a bowl of sugar until coated; shake off any excess sugar. Sift together the flour, baking powder and salt. In a medium bowl, whisk together the buttermilk and egg whites. In a stand mixer, beat together the butter and sugar with the paddle or whisk attachment at medium speed for a full 3 minutes, until they are very light. Beat in the vanilla paste, then add one third of the flour mixture, still beating on medium speed. Beat in half of the milk-egg mixture, then beat in half of the remaining dry ingredients until incorporated. Add the rest of the milk and eggs beating until the batter is homogeneous, then add the last of the dry ingredients. 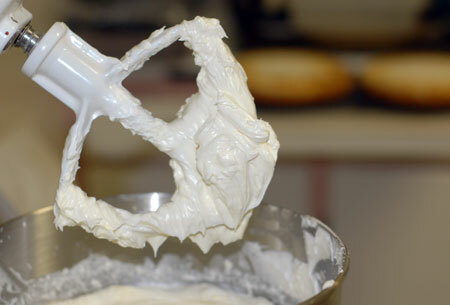 Finally, give the batter a good 2-minute beating to ensure that it is thoroughly mixed and well aerated. Divide the batter between the two pans and smooth the tops with a rubber spatula. Bake for 30-35 minutes, or until the cakes are well risen and springy to the touch – a thin knife inserted into the centers should come out clean. Transfer the cakes to cooling racks and cool for about 5 minutes, then run a knife around the sides of the cakes, unfold them and peel off the paper liners. 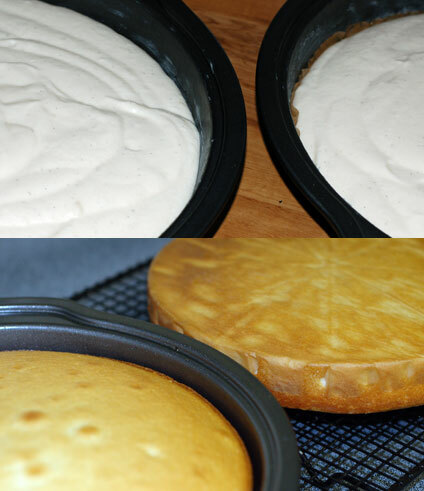 Invert and cool to room temperature, right side up (the cooled cake layers can be wrapped airtight and stored at room temperature overnight or frozen for up to two months). On medium speed, gradually beat in the orange juice and zest, waiting until each addition is absorbed before adding more, and then the vanilla. 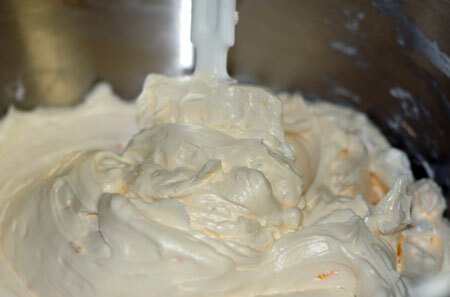 You should have a shiny smooth, velvety, pale orange buttercream. Press a piece of plastic against the surface of the buttercream and set aside briefly. Using a sharp serrated knife and a gentle sawing motion, slice each layer horizontally in half. Put one layer cut side up on a cardboard cake round or a cake plate protected by strips of wax or parchment paper. Spread it with one third of the preserves. Cover the jam evenly with about one quarter of the buttercream. 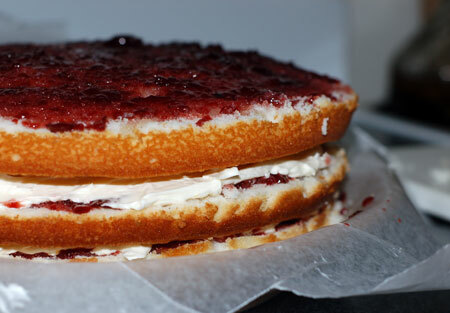 Top with another layer, spread with preserves and buttercream and then do the same with a third layer (you’ll have used all the jam and have buttercream leftover). 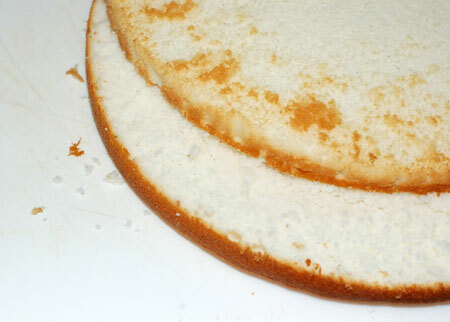 Place the last layer cut side down on top of the cake and use the remaining buttercream to frost the sides and top. Press the coconut into the frosting, patting it gently all over the sides of the cake. Decoratively arrange the candied orange slices on top of the cake. Source: Adapted from Baking: From My Home to Yours , by Dorie Greenspan (p. 250-252, 468). What a lovely variation. I thought Cara Cara was a clever name you’d made up for your post title so it IS true that you learn something new every day. Glad you joined in. 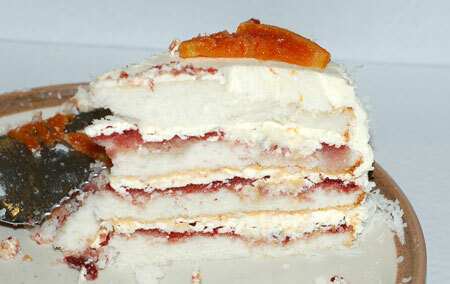 Gorgeous white layers, love your flavours! Are cara cara oranges the same as blood oranges? Never heard of them before, I’m curious. You are so creative! I love that you used these beautiful oranges to flavor and decorate your cake. Yummm…creamsicle, now who doesn’t love that? What a great change to the cake! Lovely! Truly Daring! Oh my, what a wonderful variation! The orange slices look so good! Looks great! Well done. Mine was a total hit too! Yay! I guess you’re spreading the Cara Cara love! I’d definitely never heard of them until this post, but they look and sound marvelous. I love the candied slices on the top of the cake too. I’ve never had a Cara Cara orange – but I’m going to be looking for them now!! I almost did candied oranges, so I’m glad to see that you did them. This sounds absolutely delicious! Ooh I love CaraCara Oranges- what a great combination! and I loove your candied orange slices- what a perfect job! What a gorgeous cake! I love the orange slices on top, very clever and bright! Wonderful!! You did a fabulous job on your cake. It is simply beautiful. I hope everyone at the shower enjoyed it. Let us know how things go with your almost new little one. 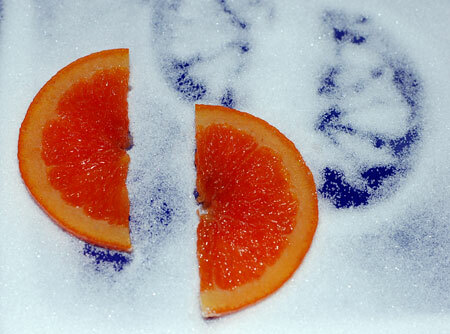 Baking Soda, cara cara oranges are not the same as blood oranges, though they have a similar look. I guess they are a variety of navel. 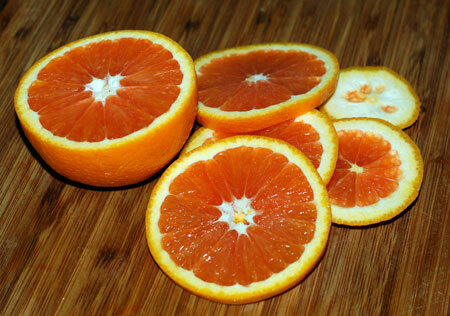 Cara Cara oranges are a type of Navel orange but sweeter and less acidic than your typical navel. My boss’ husband is a Cara Cara orange farmer and she is so generous in giving us some of their oranges every year. They truly are the best oranges!